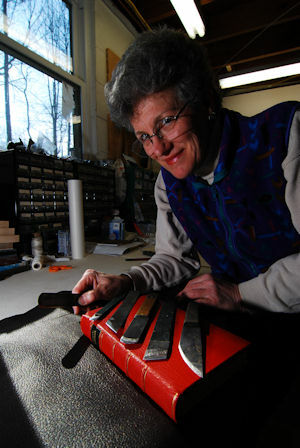 Dea Sasso has been sole proprietor of Light of Day Bindery ® since 1989. She maintains her book bindery in Asheville, North Carolina. Dea divides her time between teaching, privately & in schools, and hand bookbinding, including repair, restoration, new bindings and small editions. As the Resident Book Artist for the John C. Campbell Folk School in Brasstown, NC, Dea has been an instructor there since 1991 and now staff since 2005. In addition, she teaches at a number of art schools and institutions around the country including the Garage Annex School in Easthampton, MA; Center for Contemporary Craft in Pittsburgh, PA; Snow Farm Center for Crafts in Williamsburg, MA; BookWorks in Asheville, NC. She is a juried member of the Southern Highland Crafts Guild. Chartered in 1930 and located in Asheville, NC, the Guild now represents over 900 craftspeople in 293 counties of 9 southeastern states. You may contact Dea for private instruction. As an option, she offers a Home Stay Program where students come from many places and often live with her family on site for periods of time ranging from a few days to three months. Many of her students have gone forward in their studies and opened binderies of their own. “I came to bookbinding through a love of leather from a family of professional artists and opera singers for whom creativity and professional study continue to be major themes. In college and graduate school I was a self-taught leather worker who designed and constructed artists’ portfolios, back packs, and clothing to fund my education. In my thirties, after years in Public Health Service, I was curious to see if I could create a career and life through my craft. With guidance and training from friend and mentor, William Streeter of Heraldry Bindery, I started on an exciting professional path that would take two lifetimes to fully explore. I opened Light of Day Bindery in 1989. Formal training started with instruction from W. W. Streeter, continued with Sarah Creighton and edition binding, Daniel Kelm and classes at the Garage Annex School, and study with numerous other bookbinders and conservators. I chose restoration and edition binding initially because I lived in Massachusetts where there were many institutions and private individuals collecting books in need of repair. Once started, I discovered love for unusual book structures, precise engineering, techniques, tools, conservation and communication. My first teaching experience was with the Florida Society of Scribes who wanted to learn unusual book structures to display letterforms. The second experience in 1991 changed my life forever. I was asked to teach a book repair class at the John C. Campbell Folk School in Brasstown, NC. I’ve taught there every year since and have rearranged my life to live and work in North Carolina. Since 2005, as Resident Book Artist at the Folk School, my responsibilities in the disciplines of book and paper arts, calligraphy, marbling, and printmaking have expanded and enriched my life beyond my dreams. One of the things I love most about book arts are the many niches that captivate and excite the mind. Equally compelling are the possibilities for business opportunities and careers. More than a dozen students who came with curiosity to study at my bindery discovered their own passions for books, continued to pursue book related subjects and opened binderies of their own. I combine technical skills, experience in my own bindery and other binderies, and training I have received, to create unique books and boxes. I enjoy designing and constructing interesting, precise structures. I replicate many of my designs to sell or use them to teach students the theories of design and chronology of assembly. I often marble my own papers to replace missing ones in books or to use in small editions. In the past two years I have expanded my study to include letterpress, wood engraving and repujado. As a practitioner, I think it’s essential to find ways to continually grow within a profession. Long-time membership in the Guild of Bookworkers and now in the Southern Highland Craft Guild, have provided connections with skilled artists in the book field and a wide range of other crafts. This exposure coupled with my personal commitment to ongoing study and honing of skills has provided the synergy to keep book arts exciting for me decade after decade. No two days in the bindery are the same. Each book, each day is unique and unrepeatable. Call me with questions or comments. Resume in PDF format Here.